Let's Discuss: Does Exercise Increase Risk for Early Menopause? 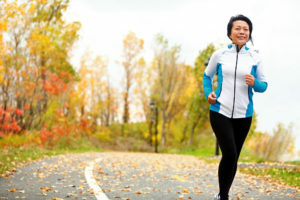 Home › Diseases and Conditions › Let’s Discuss: Does Exercise Increase Risk for Early Menopause? Menopause is a natural process that usually occurs in a woman’s late forties or fifties. During this time her body’s estrogen levels decrease and she is likely to develop symptoms like hot flashes, night sweats, vaginal dryness, mood changes, weight gain, headache, etc. However, about 10% of women begin natural menopause early, before age 45, and we aren’t really sure why. One previous large study suggested that exercise could be a cause of early menopause, but we are happy to announce a newer study has negated these findings. Let’s talk about it. The Previous Study: A large study in Japan tracked 3115 premenopausal women who were between the ages of 35 and 56. These women were tracked for 10 years and the study concluded that the women who exercised between 8 and 10 hours per week were 17% more likely to experience early menopause than the women who led a more sedentary lifestyle. The Recent Study: A few years after the Japanese study was conducted, another much larger and longer study was published. In this study, 107,275 women were studied over a period of 20 years. The women answered questions about lifestyle, medical issues, history of smoking, exercise habits, weight, BMI, diet, age of first period, etc. In this study, only 2.5% of the women experienced early menopause prior to age 45, and it seems that their risk was not affected by physical activity. What Causes Early Menopause? : We’re not completely sure, but family history of early menopause/genetics, being underweight, and smoking cigarettes are thought to contribute to your risk. How to Prevent Early Menopause: There’s not much you can do about your genetics, but avoiding cigarettes, maintaining a healthy weight, and making sure you get enough vitamin D, calcium, and high vegetable protein intake are associated with a lower risk of early menopause.